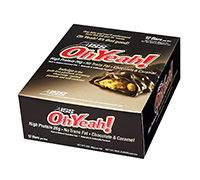 Introducing OhYeah!® Guilt Free Nutrition Packed With Milk Chocolate, Peanuts, & Caramel! Maybe that's hard for you to swallow. After all, you've bit on this kind of hype before and chewed your way through dozens of nutrition bars. What you remember is the texture and a bitter aftertaste. Well, those days are over. Now there's one health bar that tastes so good, you'll swear it's bad for you. No kidding. It's that good. Oh Yeah! Bars are jam packed with protein and loaded with roasted peanuts. After all that it's drizzled with soft caramel and surrounded by creamy milk chocolate. One bite and you'll understand how the bar got it's name!